We provide cutting edge digital content for use on eReaders, tablets and computers. Our interactive ePUBs and apps are distributed through many leading online retailers including Barnes & Noble, Amazon.com, Kobo, Google Play, Apple iBookstore, DriveThruRPG.com, and OmniLit.com. A new interactive gothic horror story by Randy A. Cook. Castle Darkholm is the second book in the “Legendary Journeys Series”. This is a decision driven novel were your choices guide the plot and the ultimate outcome of this frightening story. A great darkness has fallen upon the earth. The Sun is dead and the Moon fears his name. In this gothic horror story you are the hero as you navigate this adventure gamebook using your favorite eReader or Tablet. This is a true interactive game developed as an innovative ePub. We are please to announce Apple iTunes as our latest distributor. Slayground has signed on for the Castle Darkholm theme song. We would like to welcome Google Play as our latest distributor. Available December 1st from our online distributors and resellers. 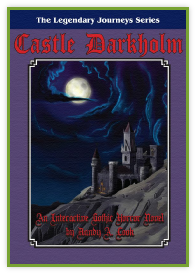 eGenesis Media announces the release of the Castle Darkholm interactive gothic horror story for eReaders and tablets.